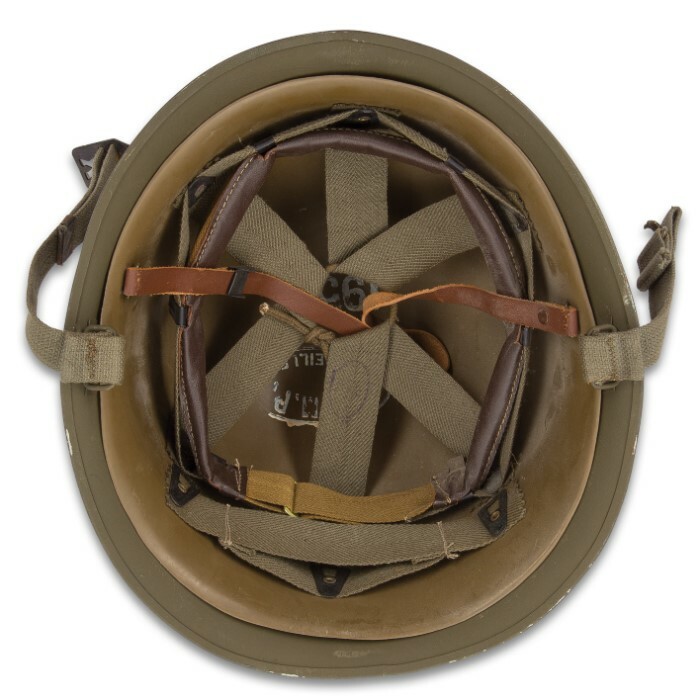 French Army M51 Helmet - Genuine Military Surplus, Standard Troop Issue - Steel Pot Style; OD Green; Molded Inner Liner; Adjustable Headband, Chin Strap - Post WWII Era, Used / Excellent Condition | BUDK.com - Knives & Swords At The Lowest Prices! Don't just read about military history - wear it! This classic "steel pot" is the genuine article - an authentic French Army M51 helmet, standard issue for French soldiers from post-WWII to the 1970s! And though it's decades old, there's still plenty of life left in this awesome piece of military history! Our supply of helmets is used (troop-issue) but in superb condition, with just some minor scratches and other cosmetic blemishes. But that's to be expected, frankly, as the M51 was a veritable solid steel tank among headgear. Even today, it's capable of providing ample head protection - perfect for tactical operations, demolition and countless other "hardhat-necessary" tasks (note advanced age and use at your own risk). Despite its tough build, the M51 is surprisingly comfortable, with its molded inner liner and fully adjustable headband and chin strap. Of course it's also great for costumes, collecting and display. And unless you own a time machine, this may be one of your last opportunities to nab one of these rare post-WWII relics. Get yours while you still can!